BPDE Protein Adduct ELISA | Cell Biolabs, Inc.
BSA standards or protein samples (10 μg/mL) are adsorbed onto a 96-well plate for 2 hrs at 37ºC. The BPDE-protein adducts present in the sample or standard are probed with an Anti-BPDE-I Antibody, followed by an HRP Conjugated Secondary Antibody. 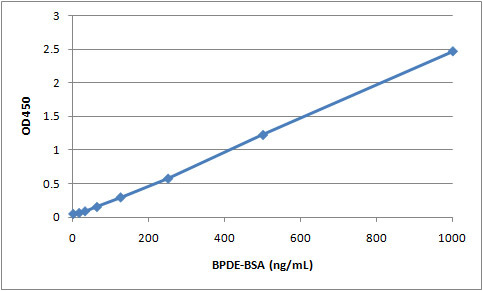 The BPDE protein adduct content in an unknown sample is determined by comparing with a standard curve that is prepared from predetermined BPDE-BSA standards. Figure 1: BPDE-BSA Standard Curve. Feng, P. H. et al. (2015). Dysfunction of methionine sulfoxide reductases to repair damaged proteins by nickel nanoparticles. Chem Biol Interact. doi:10.1016/j.cbi.2015.05.003.